Salons have long been featured in a number of light-hearted comedy films like Legally Blonde and Hairspray. These films portray the salons as places that make its customers not only look but also feel good. Beauty salons and spas have indeed become popular cinematic settings that promote friendship and solidarity. Here’s a closer look at the stories that have been filmed in salons throughout the years. Using salon equipment, a geeky or bookish girl is stereotypically transformed into a version of herself seen as prettier by her peers. Examples of this include The Princess Diaries, in which the geeky female protagonist receives a manicure, pedicure and hair treatment to become more beautiful. Thanks to the salon-grade treatment, her social status at school improves. Another kind of salon scene in films is when the girl or guy becomes someone of the opposite gender. This transformation is comedic, but with a serious purpose. In White Chicks, the two black male protagonists receive a makeover to become white females who have to solve a case undercover. In the movie She’s The Man, the female lead undergoes a makeover to masquerade as her twin brother, who has to secretly go abroad. Other salon scenes don’t typically involve physical transformations but portray moments wherein two people bond over a mutual problem. For example, the female lead in Legally Blonde befriends a salon owner with whom she shares problems with men. Eventually, they both fix their dilemmas with each other’s assistance. Placing a movie scene in a beauty shop allows the filmmaker to gather the characters in a fun and believable way. 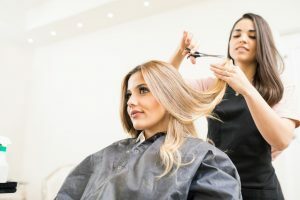 While this shows the entertainment purpose of salons and spas in film, this also echoes the real-life problems that get fixed at these places—be it on self-confidence, romance, or work.